i have installed 10.9 successfully on my samsung R530-JT02 with my hack 3.3, but i cannot seem to login to iMessage. i always could with 10.8.4 with my hack 2.8b? 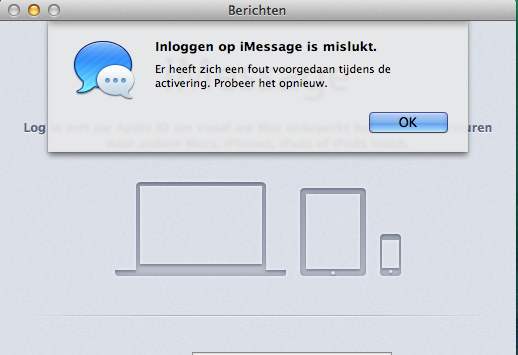 Try opening iMessage, go to Preferences ->Account and sign in with Apple ID. I have the same issue, I can no longer log in and all my attempts show that the account needs activating. I've given up I admit... I have the NVRam.dylib module installed, so doubt it's linked to that. The other thing that may work is resetting the Apple ID password. There are a lot more things. Also you need to make sure that your ethernet (not wifi!) is the first in the list! make sure Chameleon is update, instal FileNVRAM.dylib into Modules folder in extras (you have to make the folder). run myfix, restart. if it still is giving you an error try changing youre apple id password.